If you have arrived in Bangkok and want to know what to do then here is a list of 101 Things To Do in Bangkok. Choose from the long list of 101 Things To Do In Bangkok from the below list at your own leisure. From Cycle on a Biking Tour of Bangkok and Cooking classes to The Grand Palace. 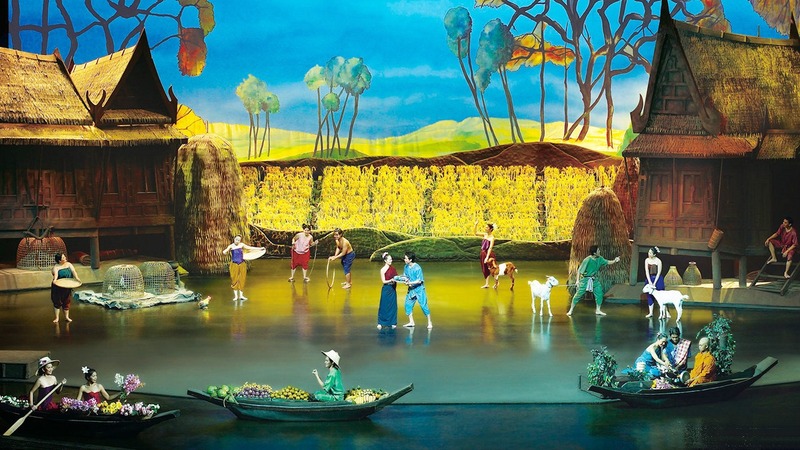 There is always something to do in Bangkok for all ages and budgets. 02. Cruise and Dine on Bangkok’s Chao Phraya River. Chao Phraya Princess or Grand Pearl Cruise. 03. All You Can Eat BBQ at Moo Ga Ta Restaurant near Victory Monument BTS Station on Phaya Thai Road. 04. 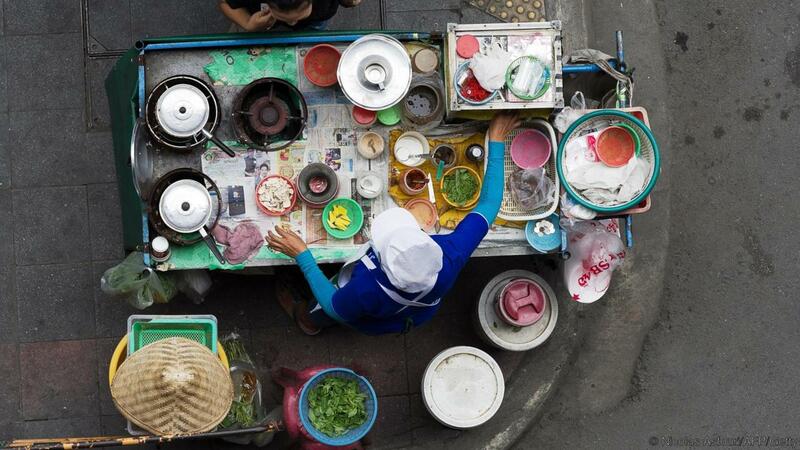 Stroll the streets of Bangkok and try some of the many street vendors throughout the city. 05. Chow down on some very cheap Beef noodles, Ratchawat Market. 07. Try the Durian fruit but be aware, some people think it smells like dirty socks. 09. Visit one of the most interesting Coffee Shops around Bangkok. P’Luang. 11. Try the Indian cuisine at Pahurat. 12. See if you can beat Asia’s Biggest Burger Challenge. (FREE if you can win the challenge). Europe Cafe Bangkok – Sukhumvi Soi 20. 13. Slurp your way through the Boat Noodle Alley. Located near Victory Monument BTS station. 15. Dine as if you are on top of the world or at least on top of Bangkok’s tallest building. Baiyoke Tower. 16. Visit the Vegetarian Festival. (Usually in September of October). It is situated in Yaowarat, Bangkok. 17. Try the original Thai Red Bull or Carabao. 18. Like Japanese food? Try the Japanese Buffet at Takumi Japanese Restaurant located within the Swissotel on Ratchada Road. 19. Big Meat eaters should head to the Today Steak at the Sam Yan market and try the Colossal Platter. 21. Bugs, Crawlies and Insects. Located all over the streets of Bangkok. Worth a try at least once!! 22. Try Thailand’s Ice Cream Sandwich. Situated all over the streets of Bangkok. 23. 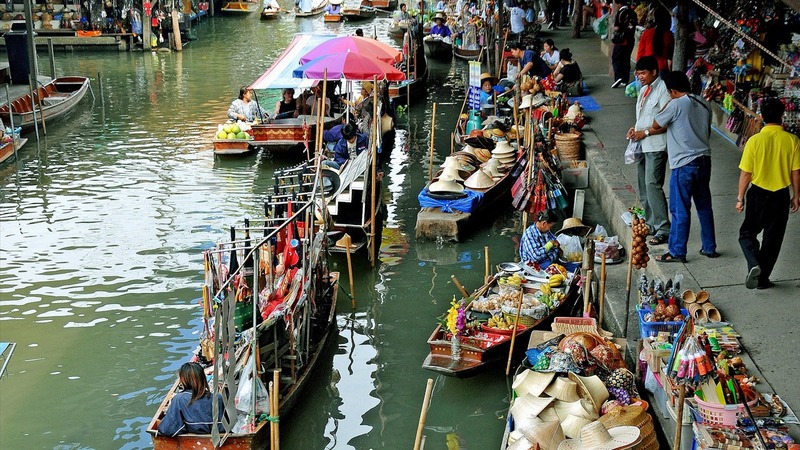 Visit the Khlong Lat Mayom Floating Market. 25. Visit some of the many Jewellery, silver, gold and Gems stores located around Bangkok. 29. Stroll through all the Malls at Siam. Found close to Siam BTS Station. 36. See all the variety of Thailand’s fruit at the Saphan Khao Fruit Market. 37. All your fresh produce can be found at Khlong Toey Fresh Market. Located near the Khlong Toey MRT station. 39. Bangkok’s famous Patpong Night Bazaar. Found at Bangkok’s Silom area, very close to the Sala Daeng BTS station. 40. Take on open air ride around a Bangkok on a Tuk Tuk. 42. Be a Pop Star at one of the many Karaoke bars located on many street corners and local hotspots around Bangkok. 43. Visit Dream World and Siam Park City and go on many of the adventure rides on offer. 44. Catch the latest blockbuster at a Luxury Movie Theatre. Theatres are located at most shopping centers around Bangkok. 45. Go street shopping at the famous Khao San Road. 46. A must visit for the food enthusiast. Dine at Bangkok’s Chinatown. 47. Have a Massage at one of the many places around Thailand. 53. Have a cocktail in style on a Rooftop Bar. Moon Bar at the Banyan Tree Hotel and Lebua Sirocco at State Tower and Vertigo. 59. Hire a Bangkok taxi and spend Some Relaxation Time at Lumpini Park. Found in between Sala Daeng and Rajadamri BTS stations. 61. Practise your golf at the Driving Range. Buckets of golf balls cost about 50 THB. 63. Practise as a Thai Kickboxer. Fairtex Bangplee. 65. Workout at the Rustic Lumpini Park Gym. 66. See a King Cobra at the Bangkok Snake Park Show. Weekdays at 2 pm. 68. Go see a Thai Football Match. Visit the Thai Football official site to see the fixture. 69. Have you ever experienced a Sepak Takraw Match. It’s a combination of football and volleyball. 70. Experiment with a Session of Hot Yoga. A different type of Thai Yoga. 71. Go on a Bicycle Tour around Bangkok. 72. Hire a motorbike taxi and be shown around Bangkok in the fresh air. 73. Ride on a Bangkok Canal Boat Cruise. Hire a Tail Boat along the Chao Phraya River for around 1000 THB. 74. Travel on a Boat to Koh Kret Island. 75. See the Temple of the Reclining Buddha at Wat Pho. 80. Another great tourist spot is the at San Phra Phrom (Erawan Shrine). Located on Ploen Chit and Ratchadamri Road. 81. 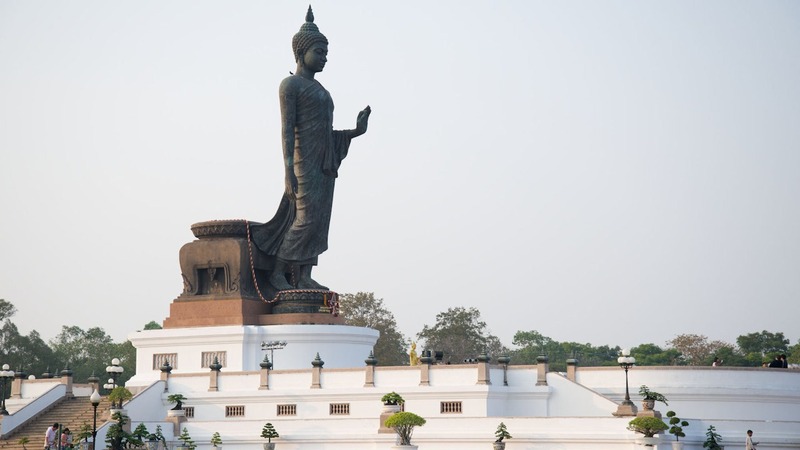 Visit the Marble Temple – Wat Benchamabophit Dusitvanaram. 82. Located outside of central Bangkok, take a tour to Wat Boromracha Kanchanapisek Anusorn. .
83. 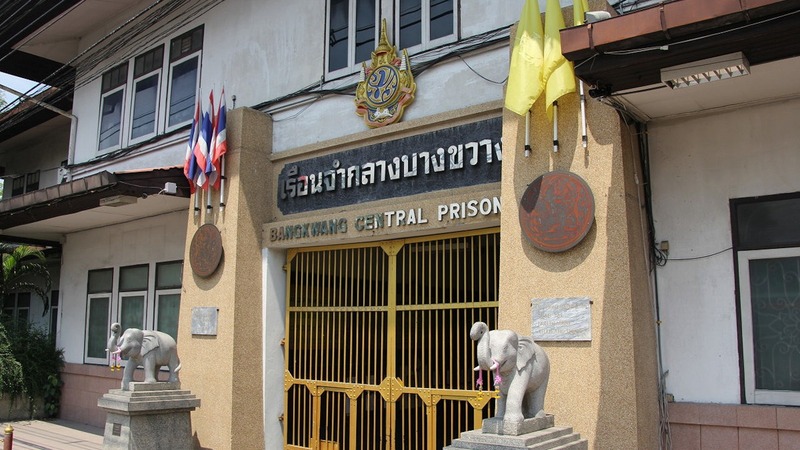 Vist Wat Hua Lamphong: Rama 4 Road, not far from Silom Road. 84. Be enthralled by the History of the Boat Temple (Wat Yan Nawa). Just a short stroll from Saphan Taksin BTS station. 85. Visit one of the Christian Churches around Bangkok. 86. 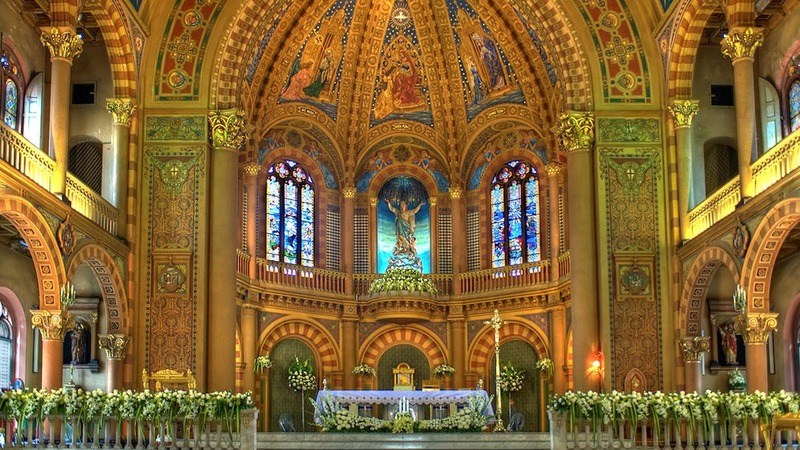 Visit the most well known Catholic Assumption Cathedral. 23 Oriental Avenue Bangrak, Bangkok. 90. Visit the Thai Craft Fair and do a Thai Craft. Whether you laze around the pool or go out and do things, make sure you have fun!!!!! There are many ways to get around Bangkok. depending on where you are going will give you the option of which way to get there. You will not have time to do all 101 Things To Do In Bangkok but you can search the below for available dates and prices.